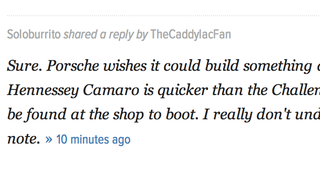 If you haven't noticed already, this person is the worst troll Jalopnik has seen in a while. He comments on every post boasting the superiority of GM products while (poorly) mocking whatever is the subject of the article. Please do not share their comments here. In fact, don't reply or acknowledge them at all. That's the way to deal with these trolls, not with tons of angry replies as those are exactly the attention he seeks. Soloburrito, I don't mean to call you out; I unshared that comment, if you hadn't guessed.